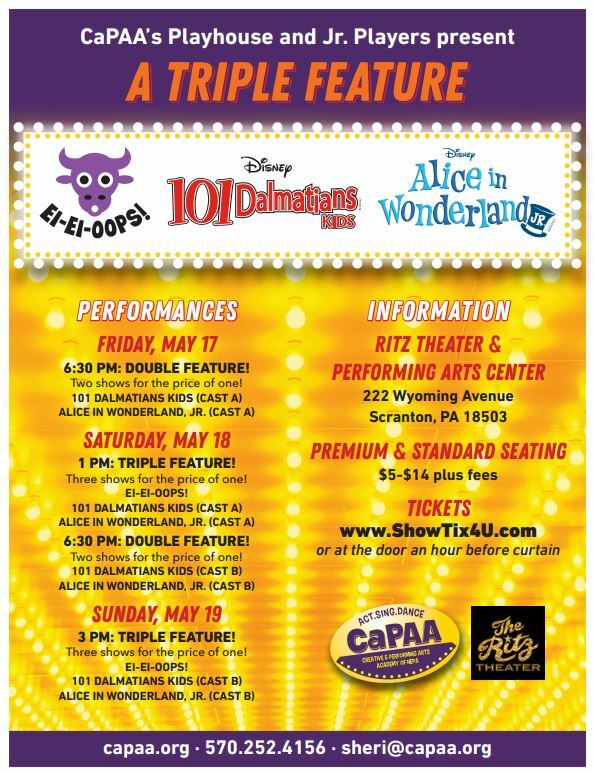 CaPAA’s Playhouse & Jr. Players presents… CaPAA presents Ei-Ei-Oops!, 101 Dalmatians, Kids & Alice in Wonderland, Jr.
Home/Events/CaPAA’s Playhouse & Jr. Players presents… CaPAA presents Ei-Ei-Oops!, 101 Dalmatians, Kids & Alice in Wonderland, Jr. DOUBLE FEATURE- 2 Shows for the price of one! TRIPLE FEATURE- 3 Shows for the price of one! Tickets available on ShowTix4U.com soon or at the Ritz Box Office and at the door an hour before curtain. Box Office opens one hour before curtain. Theater doors open 30 min. before curtain. Please note that The Ritz Theater is not wheelchair accessible at this time. There is EVENT PARKING at the LINDEN AVE lot for $5. Please contact Sheri at sheri@capaa.org or 570-252-4156 with any questions.